About 20 to 30 minutes is all it takes before your cat’s favorite canned feline food starts the irreversible process of spoiling. Yes, it’s that fast. Many budget-conscious pet parents frown upon wet cat food because of its ease of spoilage. It becomes a problem for those who may have to spend longer hours outside the home. 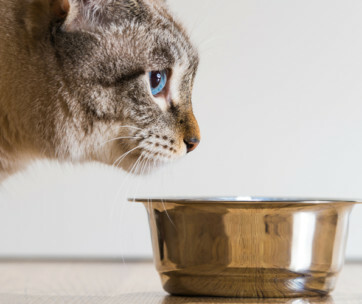 This means they have to leave wet cat food in the bowl which can expose cats to food spoilage risks. As a matter of rule, if the wet cat food has been sitting in the food bowl for more than 30 minutes, you should discard this at once. There are three fundamental reasons why wet pet food is easy to spoil. These are air, moisture, and temperature. Let’s look at them one by one. Microorganisms like mold and bacteria are ever-present in the home. At any given time, there are always microorganisms in the environment. Some of them are present in the air and can come from other sources from around the house. Wind and air drafts leave these microorganisms floating in the air until they can find a surface to land on. Once you open a can of cat food, some of the bacteria in the air can attach to the surface of the food. This is the reason why you may see a slight change in the color of the cat food. When you stir the cat food, you will notice that the inner layers still have the color of the original. The presence of bacteria on the surface of the food is what changes its color. The bacteria are already feeding on the glucose and other nutrients on the cat food. As bacteria feed on these molecules, they also produce waste products which can interact with food molecules. This creates a chemical reaction leading to the slight change in food color. Some cat fanciers believe that wet cat food may already have bacteria a few seconds after opening. It is for this reason that the 20- to 30-minute “rule” is in place. This is the maximum amount of time you can allow wet food to remain in contact with air molecules, though. As such, covering the wet cat food immediately after opening can help minimize air exposure. We know that wet cat food already contains moisture; about 75 to 80 percent on the average. Moisture is a natural magnet for mold to grow on and proliferate. These microorganisms need moisture to survive. A wet environment can activate the 50,000 to 100,000 spores that a single mold organism has. These spores can grow into individual molds which can perpetuate the cycle. In as little as 3 days, a single mold can already produce spores in the hundreds of millions. You can do the math from here. Wet cat food already contains moisture; hence the classification as wet pet food. This makes it easy for mold to grow since they already have an abundant supply of moisture. But this is not the only issue. The moisture present in the air can also hasten the speed at which molds grow. An environment with a relative humidity of at least 50% is often enough to favor the growth of mold. If the relative humidity is anywhere between 75 and 80 percent, wet cat food can grow mold in as little as 15 minutes. In contrast, exposing cat food to a relative humidity of 30 percent or lower will delay the spoilage for another 15 minutes. The optimum temperature upon which molds grow the fastest is between 70 and 90ºFahrenheit. It is in this temperature range where mold growth is at its peak. They can produce mold spores a lot faster. However, they can also grow up to temperatures of 120º. If you live in an environment where the temperature can be toasty warm, you can expect the wet cat food to spoil within the first 20 minutes. Compare this to wet cat food in a home where the ambient temperature is below 20 degrees, and you can increase the food spoilage lifespan to 30 minutes. Factoring the effects of humidity on mold growth, it is easy to see why you cannot leave your wet cat food out for longer than 15 to 20 minutes. This is if you live in a humid and hot environment. If you live in a dry and cold environment, then you may be able to increase the lifespan of the wet cat food for 30 minutes or so. It is impossible to prevent food spoilage 100%. However, there are some things you can do to help delay spoilage and extend the shelf life of your wet cat food. This will not prevent food spoilage, but it can help minimize food wastage. It is important to keep in mind that spoiling is imminent the moment you open a can of cat food. Also, depending on the ambient temperature and humidity in your home, wet cat food can spoil fast. 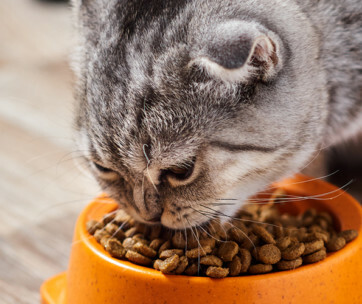 The food you put into your cat’s food bowl has the highest risk of spoilage. It can spoil in as short as 20 minutes. As such, you should discard any leftover food after 20 minutes. That’s 30 minutes if you live in an environment with a temperature lower than 70ºF and a relative humidity of no more than 30%. To prevent food that goes to waste, it is best to give it smaller feeding portions. 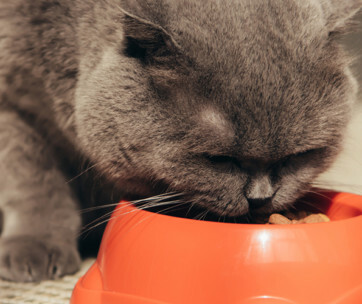 The first time you give your pet its wet food, take note how much it is able to consume. You can then base your succeeding feeding portions on your observations. Keep in mind to adjust the frequency of the feeding so you will still meet your cat’s dietary requirements. The moment you open a can of wet cat food, you are already introducing microorganisms into it. What you can do is to put the partial wet cat food inside your refrigerator. This will help prevent the growth of whatever microorganisms that may already be present in the food. Refrigerators operate at a cool temperature of about 35 degrees Fahrenheit. There are those that say you can set your refrigerator thermostat settings between 40 and 45 degrees Fahrenheit. If you set the temperature at 35 degrees, you can use the partial wet cat food for up to 7 days. If you set the refrigerator temperature to 40 or 45 degrees, your cat only has 5 days to consume the rest of its wet cat food. If there is still cat food that remains after the 5 or 7 days, don’t give this to your cat. Dispose of it at once. Before giving your cat its food that comes from the refrigerator, make sure to warm it first. Cats don’t like their food cold. You can place a serving portion of the cat food in a microwavable dish. Cover this with a plastic wrap and warm it in the microwave at the lowest possible setting. You can also place a serving size into a food plastic bag. Tighten it well and warm it under warm running water. You don’t need to make the cat food hot. You only want it to be at room temperature. There are three things you can do when refrigerating your partial wet cat food. First, you can purchase a can cover which will go on top of the lid of the can. You may have to look for one that has a universal fit so you can use it on almost any other brand of cat food. You can also use food-safe Ziploc bags. You can empty the contents of a can of wet cat food into the Ziploc bag and seal it. You can then place this in your refrigerator. It can also save more space so you can put more items in the fridge. Best of all, you can warm the wet cat food a lot easier come next dinner. Pet food manufacturers put an expiration date in their products. Manufactures put a “Best Before” phrase. Some may also use a “Use By” phrase. You may read “Best before July 1, 2019”. This means you can open and give the wet cat food to your pet before the 1st of July 2019. Keep in mind that this expiration date refers to cat food cans that are not yet open. Some manufacturers don’t put a “Best Before” date. Instead they put a phrase like “… 6 months from manufacturing date”. In such cases, you will have to compute for the number of days left from the manufacturing date. Wet cat food is easy to spoil. As such, correct handling and storage is crucial to make sure you get the most value for every can of cat food that you open.